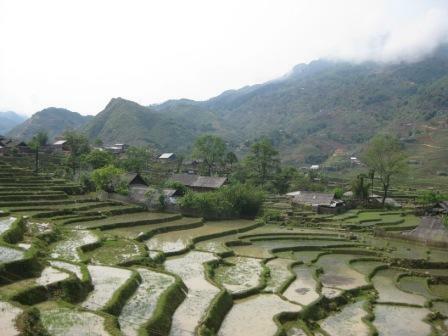 One of the highlights of our latest visit to Vietnam was our stay in the mountain resort of Sapa. Despite some stress at both ends of the journey. We had booked and paid for sleeper train tickets online before leaving Jakarta and had been instructed to pick them up at the station in Hanoi an hour before departure. There are different sleeper trains with different coaches attached – leaving for Lao Cai at different times and from two different stations. At first the company we had booked tickets from refused to recognise the booking agent we had used and shown on our booking confirmation. Then they said we had been directed to the wrong station. It was not until Shona was able to access our information online that our tickets (in an envelope with our family name on it) miraculously appeared from below the counter. Seems some kind of attempted scam going on with the tickets. Then we followed someone across several wet and muddy tracks in the dark and climbed into our carriage – no platform. Not the Orient Express but bearable once you accepted it all – apart from the disgusting shared toilet. Our friends ended up on a different train and in a lower class of carriage. The boys loved it, they commandeered the top bunks as we moved across the Long Bien Rail Bridge and through the city at night in a thunderstorm. Lucas romantically commented that all the moment needed was a candle. We arrived in Lao Cai at about five in the morning. We realised our friends were not on our train and waited for the next one. 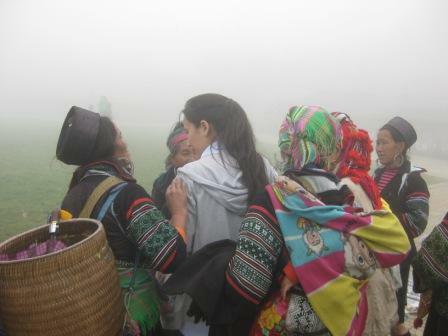 Thankfully they disembarked and we drove the remaining 38km uphill (and into the clouds) to Sapa. We breakfasted at our hotel called, Sunny Mountain View. Maybe the name was accurate, but for the next 24 hours we couldn’t see 10 meters in front of us. 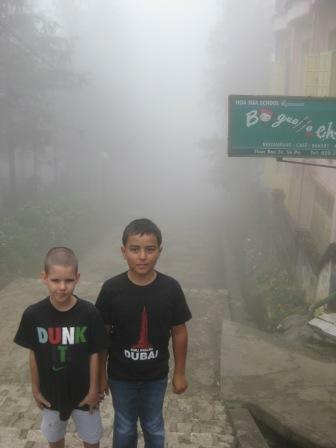 It was incredibly misty and there was a significant change in temperature. 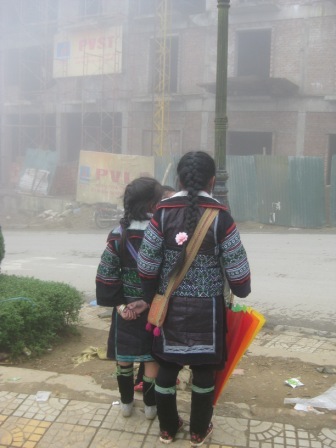 Throughout the day we were shadowed by tribal ladies up and down the streets. 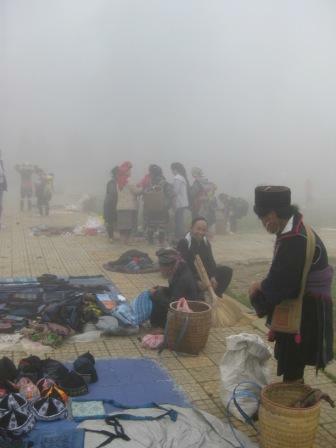 The town hosts several hill tribe people buying and selling. The H’mong tribe ladies are canny traders and encouraged us to buy their silverwork and embroidery -produced from their trademark baskets tied to their back. If not a basket, an infant. We visited the Saturday market and bought fake waterproofs and footwear in preparation for a guided walk the next day. Sergio and I went for a run – running down the mountain we talked as old friends do who have not seen each other for a while. Then we turned and headed back up the mountain – unable to talk. A shared bottle of Glenmorangie in front of an open fire helped the recovery process later that evening. 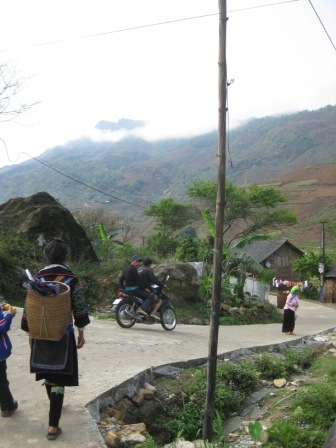 Next day we used a local guide from the Sapa Sister’s Tour company and she took us for a walk. 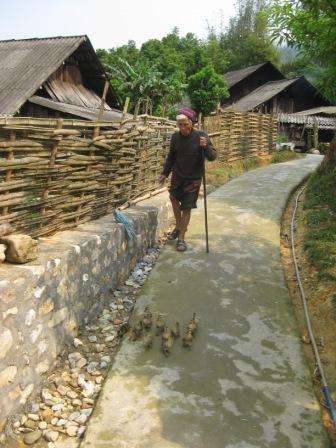 We snaked down the valley, escorted by several H’mong ladies and tried to avoid creating bottle-necks as we met scores of other organised walks heading the same way. The weather cleared and finally we were able to see the beautiful mountains and valley, so close to the Chinese border. A hydro-electric dam is being built and soon much of the valley we were walking through would be under water. Rice terraces clung to the slopes on all sides. 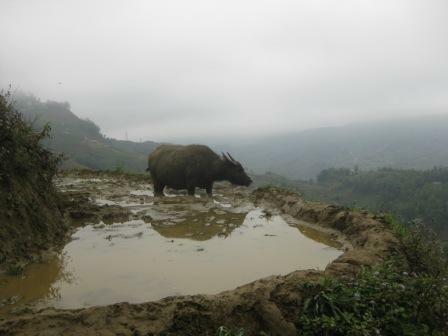 Franco and Lucas were in their element running ahead, play-fighting and digging with bamboo sticks, starting mudslides and splashing through water while avoiding the Buffalo dung. They can’t resist trying to touch baby birds being herded by an angry old man. Tourists are herded into a village canteen for lunch. 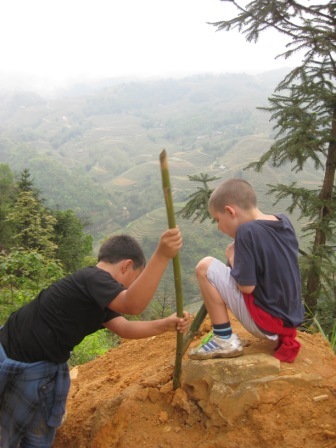 We ate fried rice and then continued our walk – before being picked up and driven back up to Sapa. We showered at our hotel and prepared for the night train back to Hanoi. Not surprisingly, we had to collect our return tickets at the station an hour before departure and go through the role of helpless tourists all over again. 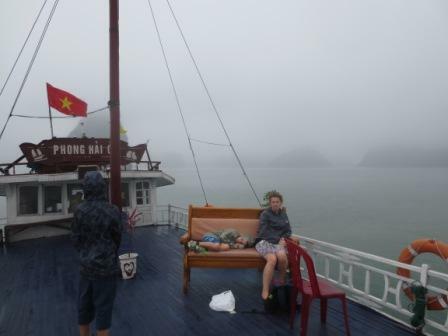 Back in Hanoi, we said a sad farewell to the Descalzo family and drove to Halong Bay. Cairo got food poisoning at the hotel. Sick all that evening and weak the next day. He stayed in the hotel with his mum as Lucas and I tried to get on a boat out to the bay. The weather was very poor and heavy rain battered the ticket office. It seems you can’t just turn up and get on the next boat leaving. There is money to be made even at the official boat terminal. Their advice was to take a seat and wait for other tourists to arrive. There were two other people waiting. They suggested we buy a boat for a couple of million dong. Turns out most people book a tour in Hanoi and avoid this nonsense at the ticket office. Tour parties came and went as we sat waiting for other tourists to arrive – tour guides looking smugly at us. The weather got worse and we decided to call it a day. We decided we would book a tour for the following day through our hotel and accept paying the millions. Next day we set off in a boat of our own, including tour guide, for a four-hour trip around the bay. 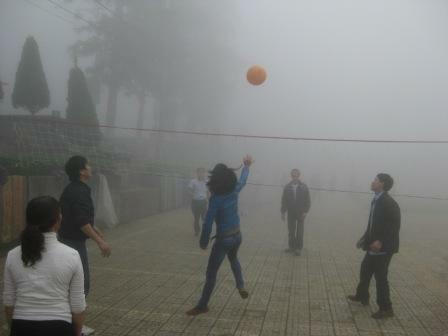 The weather remained foggy and wet. It did mean we had the bay and the caves pretty much to ourselves. Some gaudy lighting in the grottoes but still impressive. We sailed (painfully slowly) to the floating fisherman’s village (no sign of the bar shown in Cairo’s favourite TopGear programme) and around the rocks. 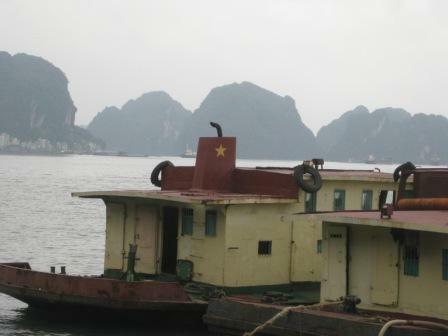 In the high season hundreds of boats float around Halong Bay each day. I’m glad we went but it didn’t set the heather on fire. 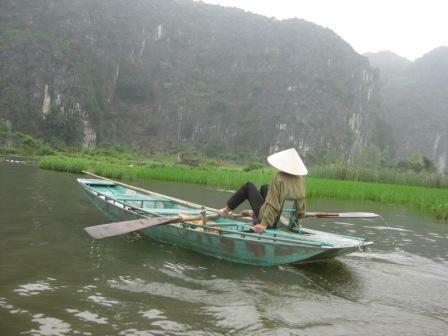 We returned late on Saturday evening having spent another fantastic holiday in Vietnam. This time we explored the North. We also met up with the Descalzo family – some very dear friends from our time in Cairo. 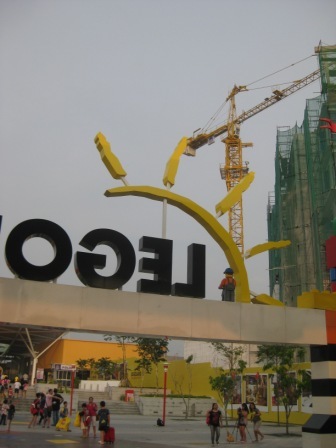 But first the boys had a date at the new Legoland in Malaysia. We flew in to Singapore thinking that the crossing into Malaysia would be easy. It was not. The Woodlands Checkpoint is a vast complex at the end of the causeway. We had to get off and on different buses carrying our luggage, walk through and queue at two busy passport controls. A stamp leaving Singapore and a stamp entering Malaysia. It took over an hour to get through. We stayed at Air Asia’s Tunes Hotel in Johor. Cheap and cheerful next to an excellent Indian restaurant called 7 Spice – and only twenty minutes drive from Legoland. I’m going to try and get the boys to blog about their day there. The following day we headed back across to Singapore. 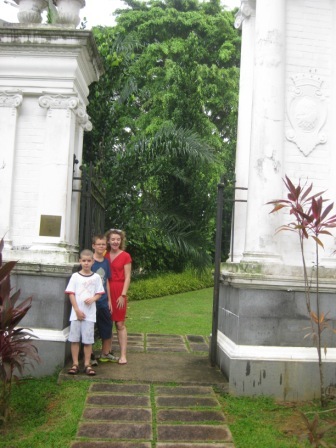 Shona had recently found out about a relative who had lived in Singapore and the whereabouts of the cemetery he was buried in. 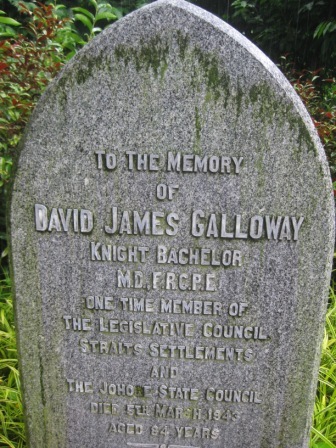 David Galloway was a well-respected and influential doctor in the colony. On the final walk up to the cemetery from the metro station we heard pipe band music. It turned out that the cemetery is next to a Gurkha police barracks and it was their band we could hear rehearsing. We found the grave quite easily in a well-tended part – just before the heavens opened. We flew from Singapore to Hanoi. No massive wait this time for our visas. We checked into a great hotel called the Hanoi Elegance Diamond. Our first glimpse of Hanoi was at night. Our hotel was in the old quarter close to Lake Hoan Kiem, meaning The Lake of the Returned Sword. We walked around the lake and returned to our hotel’s rooftop restaurant for food. Next day we explored the city. A heavy, washed-out sky that never changed. 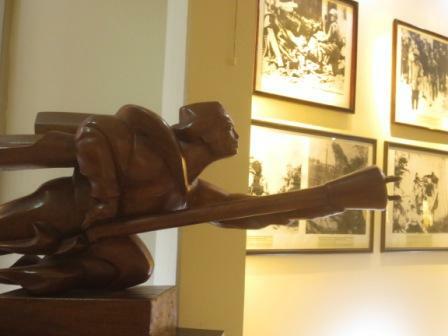 First stop was the Museum of Vietnamese Revolution. Our intention had been to visit the History Museum but we ended up next door. The museum celebrated the never-ending struggle the country has endured for centuries against Chinese, French, British and American aggression and oppression. Gruesome photographs and homemade revolutionary flags, personal items from revered revolutionaries, many of them women, made this a worthwhile visit. I had always wondered what the stick-like weapon with the three prongs was used for, shown in revolutionary posters and now in the hands of many statues in the street. We found out they were suicidal anti-tank weapons – requiring the bomber to run at the tank and basically prod it. Amazing bravery. In the final room upstairs sat a guillotine from the French built prison of Hoa Lo. The information accompanying the guillotine stated bluntly that it was used by the French to execute political prisoners right up until the 1950s. The Americans then used it for a while. Barbaric. Lucas was very upset. 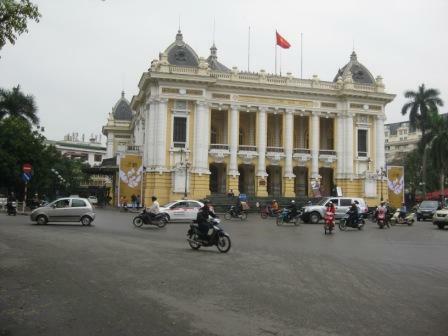 We walked out to find some bookshops and then visited the Vietnamese Woman’s Museum. 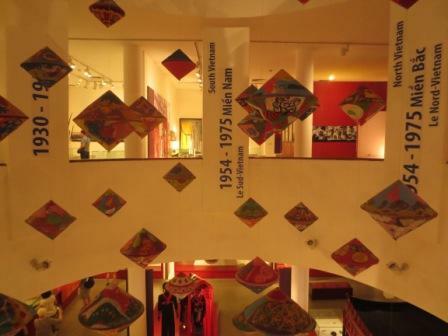 Although the boys were not taken with the Women’s fashion floor this was a great wee museum – with other floors explaining rituals, marriage customs, childbirth and family life and the significant role of women defending the nation. There was a fascinating exhibition, Worshipping Mother Goddess – a purely Vietnamese folk belief. Still widely practiced the worship addresses the concerns of daily life and desires for good health and fortune. Basically, a lot of colourful dressing up, dancing, singing and women getting together at the temple. Then finally we visited the Temple of Literature. Next to the university, I think it was built to celebrate Confucius. 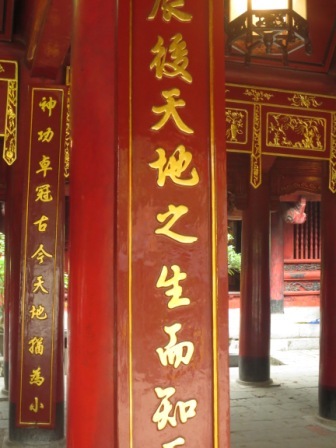 The names of prominent graduates from the university are carved on large tablets carried on the backs of stone tortoises. Modern day students come to rub the tortoise’s nose for luck during exam time. Outside the temple vendors and street hawkers lined the walls. 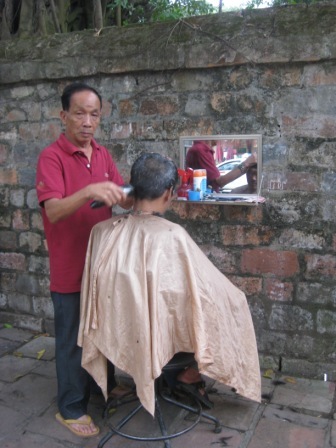 Open-air barbers hung mirrors on the walls and sat on their own chairs waiting for customers. Cairo declined the chance for a quick trim. 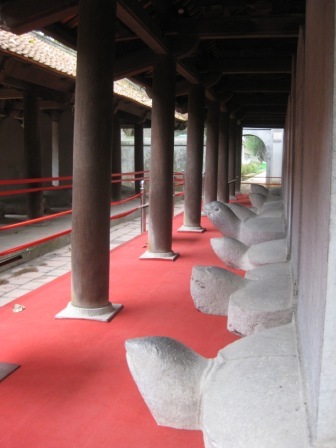 With the Descalzo family we headed off to the ancient capital of Hoa Lu. 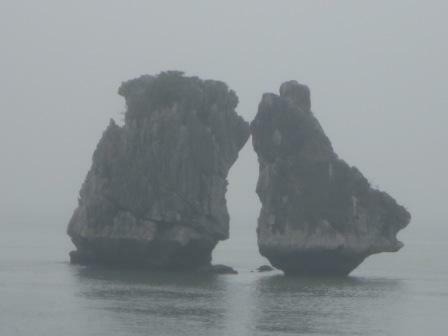 We visited Trang An and the grottoes. 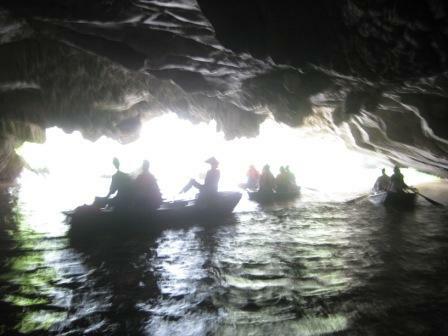 We hired small boats and we were rowed through an incredible waterway and under mountains. Our ferry-woman started rowing with her feet and had incredible stamina. 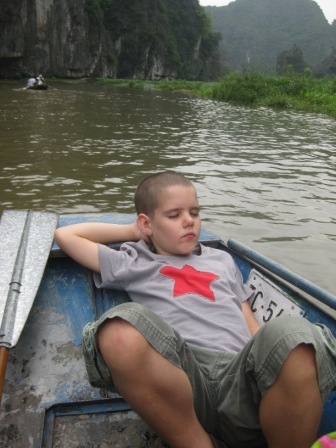 Lucas fell asleep in our boat. The silence was amazing. 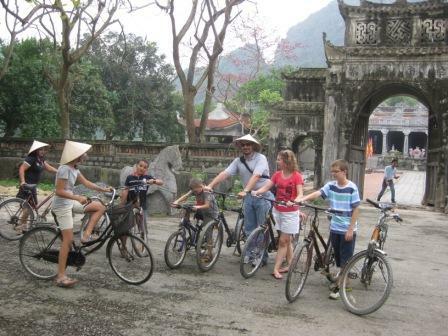 We had lunch at a local restaurant (the boys tasted roasted goat) and then hired some old bikes and cycled to a temple. 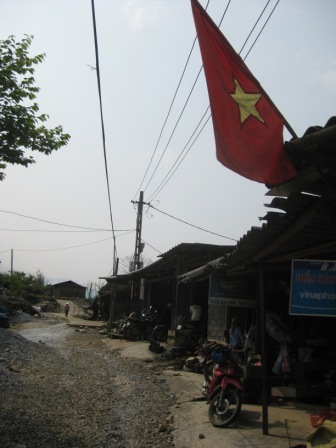 Then it was back to Hanoi to catch the train to Lao Cai. 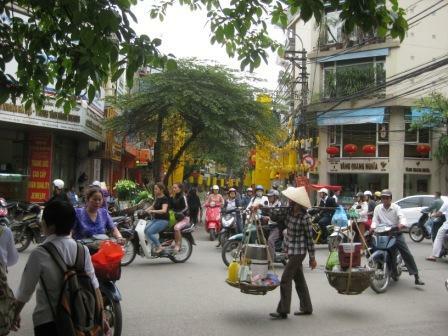 On our return to Hanoi we spent our last day doing some shopping in a brand new mall. We also visited the Fine Arts Museum. Not a patch on the one in Saigon – too much bad revolutionary art and the ceramic rooms were closed – but interesting enough. 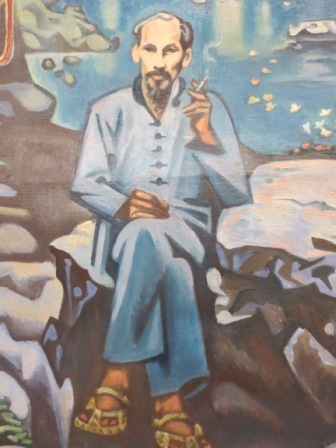 Cool painting of a familiar looking fella having a satisfying smoke. We also paid our respects to the great man and visited his mausoleum. Very strict security and decorum as we walked past the embalmed body of Ho Chi Minh. We walked through the Presidential Palace grounds. This is the last time I venture anywhere without a Rough Guide or a Lonely Planet. I really missed all the additional information about places we visited and the little quirky stories you often find in them. 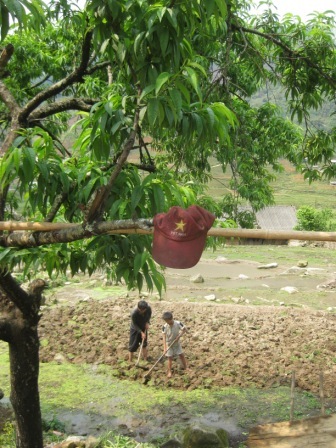 Also, I think we will be back in Vietnam.